This post is mostly based on an original press release by the Austrian Archaeological Institute, published on November 19th. Copyright for all photographs, unless otherwise indicated, belongs to the Institute/Photographer: Niki Gail (© ÖAI / Foto: Niki Gail). A view of the newly excavated 7th century AD Byzantine taberna, with “Kouretes Street” on the left. (Image: © ÖAI 2015/ Niki Gail). Ephesus is not just one of the most famous and most impressive archaeological sites in Turkey (it was added to the UNESCO World Heritage list last summer), a treasure trove of remarkably well-preserved and unusually impressive monuments, especially from the Roman Imperial era. It is also a site that is still developing: archaeological excavation and restoration are still continuing more than a century since the first excavations there. Under the auspices of the Austrian Archaeological Institute, an ambitious long-term research programme produces new finds year after year. Earlier this week, we placed a short post about such a new discovery on Facebook, as we do now and then – and it turned out to beone of our most popular posts this year, receiving 222 “likes” and being shared over 180 times. 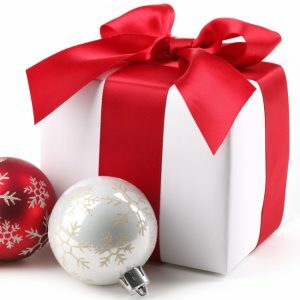 Since the popularity of the post indicates that people found the discovery interesting, since Facebook as a medium does not invite much depth, and – most importantly – since the discovery has apparently found no echo whatsoever in any English-language media, we are eager to offer a little more detail here. The street follows what is essentially an inclined saddle between two steep hillsides, both of them constantly subject to slope erosion. 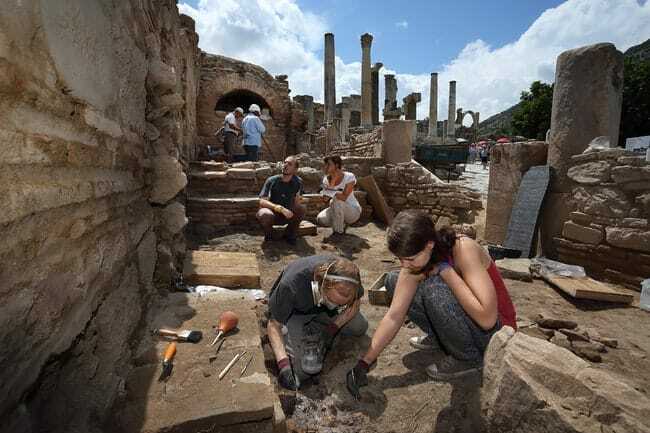 Excavations have – so far – been mostly limited to the street itself, its colonnades and a number of monuments alongside it, such as the famous Terrace Houses or the Temple of Hadrian. But especially on the upper stretch, the visitor only sees the street itself, the rows of pillars belonging to the colonnades on either side, and – a short distance behind them – a wall pierced by multiple doorways. The spaces beyond remain largely unexcavated. 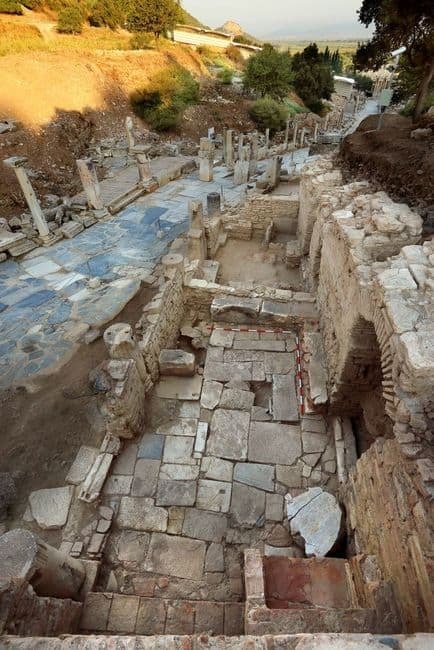 When we guide there, we tend to tell our guests that the doorways probably gave access to shops lining the street – this is a conjecture, admittedly, but one based on good evidence from other ancient cities, and now proven for Ephesus. Such spaces behind colonnades are known as tabernae, and their functions were usually commercial, including shops, workshops and catering. What happened in 2015 is simply this: in the process of clearing away sediment that had recently washed down the slopes, so as to shore it up, the excavation team revealed one of those tabernae. Built benches and a marble table (probably a reused element of an earlier building) within the taberna. (Image: © ÖAI 2015/ Niki Gail). Normally, we would expect to find just the foundations and fixed features of such a structure, which is why what came to light this year can be described as sensational. 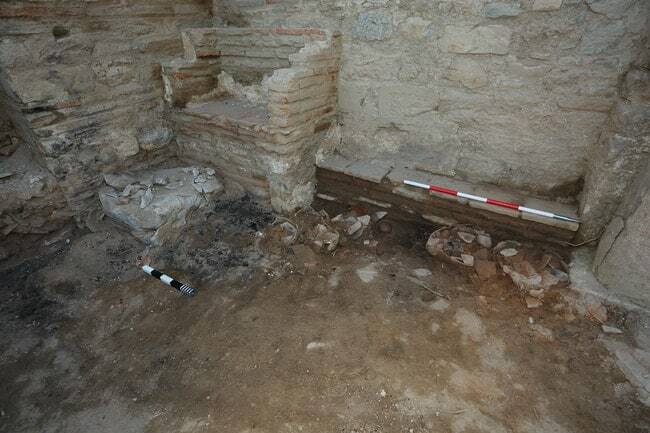 The archaeologists uncovered a taberna that still contained some stone-built furnishings and a vast quantity of movable objects! Benches, stone tables, over a hundred vessels such as drinking cups, bowls and plates, as well as a number of amphorae, the standard vessel for storing and transporting liquids such as wine, were found within the structure, including ones from as far afield as Cilicia (now southeast Turkey) and even Gaza. The space was clearly a place dedicated to the serving and consumption of food and wine, including imported produce. The Austrian newspapers affectionately call it a “Beisl“, a Viennese dialect word for a small wine restaurant, so “wine bar” may be the most appropriate, or alternatively “tavern”, a term directly derived from taberna. We know such establishments from many ancient cities, most famously from Pompeii and Ostia in Italy: just like today, where there are many people, especially non-locals, they will want to eat and drink. The fact that so much material was left in situ is in itself remarkable and informative. If the establishment had simply been abandoned at some stage, usable objects would surely have been removed. Instead, the finds indicate a catastrophic destruction, perhaps due to an earthquake, many of which have struck Ephesus through the ages. For the newly-found taberna, the event can be roughly dated on the base of the coins left behind, which must have been in circulation when it happened. They were (mostly) struck during the early reign of the Byzantine Emperor Heraclius who ruled from 610 to 641 AD. As cities are normally rebuilt after such catastrophes, additional factors must have affected Ephesus at the time, preventing its full recovery. The Byzantine era is an important one for the history and archaeology of Ephesus. The city, a key harbour and also an important centre of pilgrimage to the Temple of Artemis in pagan antiquity, had managed to retain the latter role after the advent of Christianity through its association with St. John and the Virgin Mary, both whom are said to have lived there. A series of very large early churches attest to the special status Ephesus enjoyed at the time: the city was still a large and splendid one, at least until the event that destroyed the newly-found taberna struck it. Work in progress during the excavation of the Byzantine taberna. (Image: © ÖAI 2015/ Niki Gail). To paraphrase Sabine Ladstätter,the Director of the Austrian Archaeological Institute and of the Ephesus project, the newly discovered “wine bar” offers a clearer image of Kouretes Street as a “boulevard“, an artery and a centre of urban communications, a theatre of economic and social activity. It is easy to imagine the place in use: people dropping in to try a cup or two of a new batch of imported wine, others staying for a meal and a chat, some sitting under the pillars outside, perhaps enjoying a game of backgammon (there are many carved gaming boards at Ephesus), while crowds are moving up and down the street itself, just as the visitors are today. Let’s hope for more such exciting discoveries, at Ephesus and elsewhere. For more detail, you can download the original press release (in German) here. If you want to see the place for yourself, you can do so on many of our expert-led tours in Turkey, especially on Cruising to Ephesus, next year.